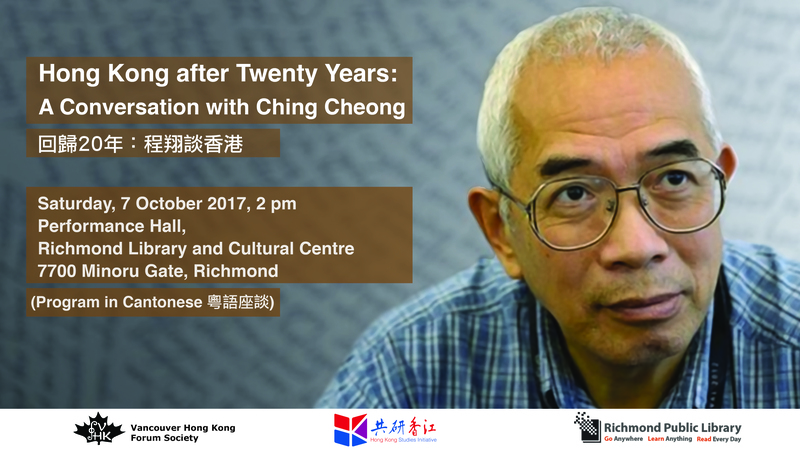 Please join veteran journalist and political commentator Ching Cheong 程翔 for a conversation about the past, present, and future of Hong Kong. Born in Guangdong, China, in 1949, Ching Cheong graduated from St. Paul’s College, Hong Kong, and, in 1973, from the University of Hong Kong with a degree in Economics. Ching then joined the local pro-Beijing newspaper Wen Wei Po 文滙報 and became, in time, its associate editor-in-chief. Following the massacre in Tian’anmen Square in 1989, Ching, along with a number of colleagues, resigned from Wen Wei Po in protest and founded the current-affairs magazine Commentary 當代. A senior correspondent for the Singapore-based The Strait Times from 1996 to 2009, Ching was accused of spying by the government of the People’s Republic of China and was imprisoned in China from 2005 to 2008. This event is jointly sponsored by the Vancouver Hong Kong Forum Society, the UBC Hong Kong Studies Initiative, and the Richmond Public Library.